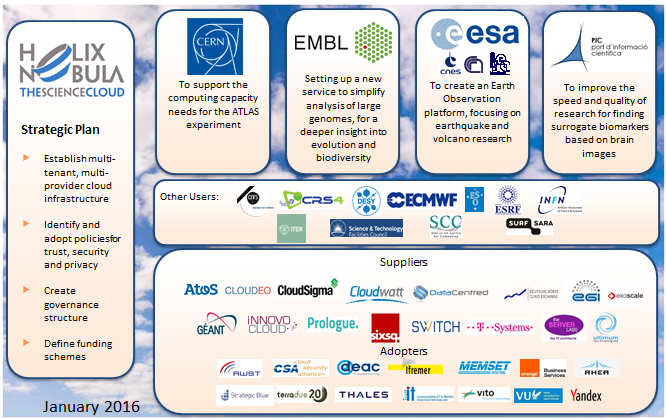 The Helix Nebula Initiative is a partnership between industry, space and science to establish a dynamic ecosystem, benefiting from open cloud services for the seamless integration of science into a business environment. Today, the partnership counts over 40 public and private partners. 2016 - 2018 HNSciCloud: HNSciCloud is the European Pre-Commercial Procurement (PCP) project co-funded by the European Commission Horizon 2020 Programme. It aims to create a competitive marketplace of innovative cloud services serving scientific users from a wide range of domains. The marketplace builds on a hybrid cloud platform including commercial cloud service providers, publicly funded e-infrastructures and buyers' in-house resources. To achieve these objectives HNSciCloud will issue a public tender in 2016. 2014 - 2016 PICSE: PICSE is a support action funded under the first wave of H2020 1st call, started on the 1st October 2014 in the field of procurement of cloud services for the public sector. 2012 - 2014 Helix Nebula - the Science Cloud: The Helix Nebula - the Science Cloud funded project supported the massive IT requirements of European scientists. The project aimed to pave the way for the development and exploitation of a Cloud Computing Infrastructure, initially based on the needs of European IT-intense scientific research organisations, while also allowing the inclusion of other stakeholders’ needs (governments, businesses and citizens). The pan-European partnership across academia and industry worked to establish a sustainable European cloud computing infrastructure, supported by industrial partners, which will provide stable computing capacities and services that elastically meet demand. The work started by the Helix Nebula - the Science Cloud project is today continue by the Helix Nebula Initiative.